Her blood is cursed. And five people are held accountable. The lover who abandoned her. The sister who betrayed her. The priest who refused her. The woman who shunned her. The man who failed to kill her. Kidnapped and secretly transported to the Canadian wilderness, five strangers are abandoned on an island in the midst of a huge glacial lake. When the full moon rises, they become prey for the most unholy of creatures. 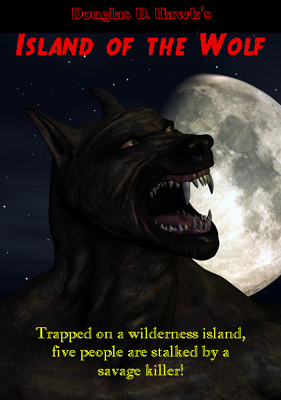 Stalked by a blood-maddened beast, the five struggle to survive on the Island of the Wolf. This chilling, thrilling novella is available for the Kindle only $.99. CLICK HERE to access it at The Kindle Store. Island of the Wolf is a taut, exciting thriller that brings the terror of being hunted by a monster to life. When a group of seemingly unconnected men and women are stranded on an island and told they are going to be tracked down and killed in retribution for betraying their kidnapper, the stage is set for a game of hide-and-seek where the losers die a horrible death. Will any of our characters make it off the island alive? Douglas Hawk sets the stage with great effect and the suspense never lets up. Though a relatively short novella, Hawk packs more punch into his story than most writers can in books three times as long. The characters are surprisingly well drawn considering the brevity of the narrative, and the werewolf action is dark and brutal. Highly recommended to all werewolf afficianados and anyone who appreciates a lean, efficient scarefest. Worth a look if you are a great werewolf story fan.